Very much like the Jungle Rubber launched few weeks ago but with a Leather scabbard that is just leather and no wood in the inside like a normal Khukuri scabbard. Very much like the Jungle Rubber launched few weeks ago but with a Leather scabbard that is just leather and no wood in the inside like a normal Khukuri scabbard making this Khukur blade very practical, comfortable and no bulkiness at all. The blade sits firmly on ones thigh once the leather cord is tied on ones thigh. 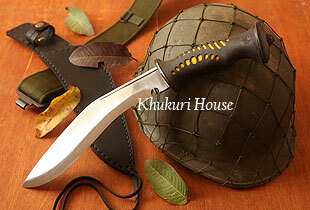 The Jungle khukuri blade to take in the Jungle to rumble.